Sikh Diwali is called ‘Bandhi Chhor Divas’ meaning ‘Prisoner Release Day’. This year it falls on 17th November. This is the day when Guru Hargobind Sahib Ji, the sixth Guru, was released from Gwalior fort along with 52 other prisoners. Jahangir was surprised by Guru Ji’s popularity in the fort. Troubled with fearful visions, the Emperor gave orders for Guru Ji’s release. But Guru Ji refused to come out of the fort until all the other 52 innocent prisoners were set free. The Mogul Emperor, thinking himself to be clever proposed to release any and every prisoner that could hold on to the Guru’s clothing. So Guru Hargobind Sahib Ji ordered a special cloak to be made with 52 tassels. 52 pieces of cloth of different lengths were then tied to each tassel and each prisoner held one of these. It followed that on the day of Diwali in 1619 AD, the 6th Guru was released from Gwalior fort along with all 52 Hindu kings. Henceforth the Guru was called the ‘Freedom Provider’ or ‘Liberator’. He was greeted by Bhai Gurdas Ji, Baba Buddha Ji, Mian Mir (a Muslim Sufi Saint and friend of Guru Ji) and many other disciples. 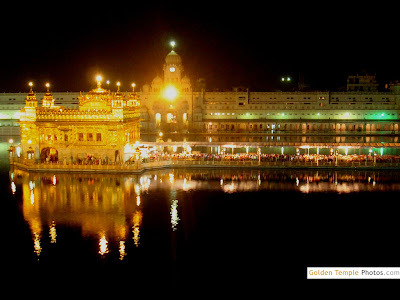 Guru Ji returned to Harmandir Sahib (Golden Temple), Amritsar, with the 52 Kings where a magnificent celebration was held. The Harmandir Sahib (Golden Temple)was beautifully lit and decorated and fireworks illuminated the sky. People were elated and they sang Religious hymns. May the Divine light of Diwali spread happiness,peace & prosperity to you and your family ! May the lights of this auspicious festival fill your life with the eternal glow and happiness. A very Happy Diwali to you and your Family.. Very nice perspective from Sikhism. Avery happy diwali to you and your family! and thanks for sharing this info! happy Diwali and God bless! 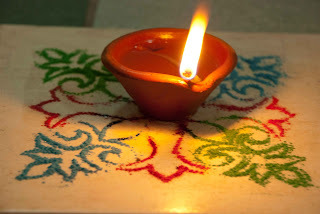 Happy Diwali ! After so long! I am sure that you've had a great Diwali .Harman i have got guests (from abroad) at home - they would be staying for a month and you know how it is as relatives all over are coming to meet them .Will try to be back to blogger as soon as possible. Wishing Happy & prosperous DEEPAWALI to you and your family.